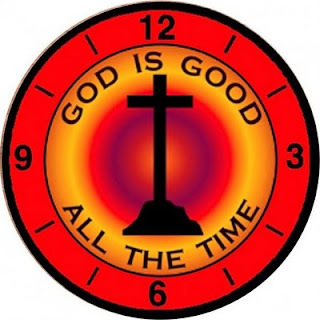 Apostolic Revelation: Is God Really Good All The Time? Truly, My God Is Good All the Time! The Bible simply declares that "The LORD is good, A stronghold in the day of trouble; And He knows those who trust in Him." (Nahm 1:7). 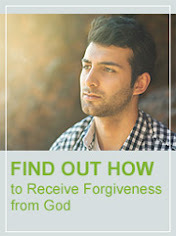 We humans usually determine God based on the feelings that we have on a particular moment. Say a person faces a sudden stromy trouble on a particular day and got in to a severe crisis of a lifetime, he will definitely feel, 'God where are you? Why should this happen to me? Are you really good to allow these things in my life? and so on and so forth...' You know why we think like this, it is because of a damaged mindset in us that has come as a result of the fall of our first parents [i.e. Adam and Eve]. God calls this as a deceptive and a incurably sick heart [i.e. mindset or thinking pattern] that has come from the fallen natural soulish man (Jer 17:9). But a spiritually mature man like Job in the Bible will seek God and say like him, "Though he slay me, yet will I trust in him..." (Job 13:15). In this verse God became a sure stronghold for Job in the day of his trouble. He was able to trust God because he has already found out in his life experientially that 'God is good all the time'. The greatest need in our generation for all people is to experience God daily as a good God and this comes only by believing what He has already said about His unchanging character. God's character is always the same and he does not change a bit (Malachi 3:6). In fact, if he changes He cannot continue to be a perfect God of justice. My dear Christian Brothers and Sisters, remember the goodness of God in the midst of the fire of adversity. This is what it really means to trust in the Lord. God takes you though adversity in order to draw you closer to Himself. The very fact that there are problems and storms in this life shows that God is good all the time, and that He wants to make you realise it by your own choice of knowing Him intimately and by trusting in His unchanging character. In other words, if there are no problems at all in our life, we will never ever be able to experience that God is good all the time. In my life after I finished my engineering I got in to numerous storm after strom at the age of twenty. One of the storm was a hyper thyroid secretion ⁯that was three times more than the normal level. It completely immobilized me and made me to limp everyday. It took me through severe depression at that very young age itself. At that time I had faith in God, but always rejoiced in God only when good things happened in life. In other words, God was good to me only when good things continued to happen in life. Other times I was perplexed and depressed when things did not happen my way. But through the crisis God reached out to me through a word that was written on the calender. That verse is Psalm 62:8, "Trust in Him at all times...God is a refuge for us" which got quickened in my spirit, and for the first time in my entire life I realized that God can speak directly through His word right from my spirit-man inside me (Rom 8:16). I felt like this verse on the calender was torn from the calender and got landed up in to my mind. I began to trust in God from that point of time onwards that he is good all the time. Yet my natural soulish mind cried out for justification against what I believed. But I started to reject the soulish voice of the malfunctioning sensor which was working against God (Gal 5:17). You know the amazing thing that happened through this crisis, I voraciously consumed the word of God. It became the only comfort that I had through the whole ordeal (Psalm 119:49-50). Basically I have always been a shy introvert through out my life upto that point in my life. But something happened, from that point of time "...His word [began to take hold of me and] was [beginning to dwell] in my heart like a burning fire Shut up in my bones; I was weary of holding it back, And I could not." (Jer 20:9). 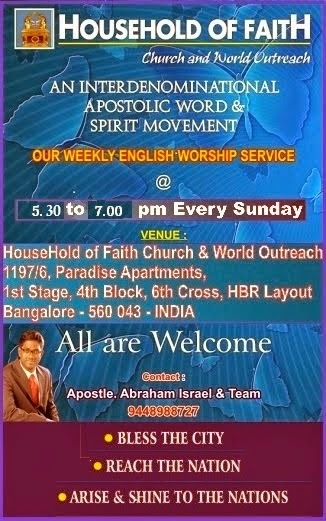 I began to speak about the word of God with all boldness in the Spirit. This may not be a great thing to many people normally, but to me it is a pure miracle. You know, from my childhood days I would practice for all dramas in my sunday school classes. I would be the best performer during all sessions and would get greatly appreciated for which I always looked forward to. But once the D-Day comes, I would confidently go before the audience only to forget what to do and speak next. It was only embarrasment all the way, time after time.Oooh Praise the Lord for He is Good and His mercies endureth forever (Ps 107:1)! The trials in my life did not vanish instantly but it has continued in varied intensity according to level which the Lord has allowed it for the past ten years (1 Cor 10:13). Today, I am here to testify before the Lord that now I consider myself, one of the most blessed man in the entire earth because of the tremendous change that the Lord has wrought to me from my inside-out. This is why Apostle James says, "10 My brethren, take the prophets, who spoke in the name of the Lord, as an example of suffering and patience.11 Indeed we count them blessed who endure. You have heard of the perseverance of Job and seen the end intended by the Lord --- that the Lord is very compassionate and merciful." (James 5:10-11). Are you ready? You are asking me for what? To embrace storms and trials and keep trusting that God is good all the time. If you do, you will become greatly blessed like never before in this end time generation. The Lord is counting on you as a friend (John 15:14-15), don't let Him down by trusting your soulish feelings, but trust and keep on trusting in the goodness of the Lord all the time. Praise the Lord!